The Fullers was not a true ale. I’ll admit that I’m rather spoiled by the beer I’ve had in London. I know, you Brits drink a lot more lager (Budweiser — the official sponsor of Man U) than the cask but every single pub I’ve been to has “real ale” on tap in London. Real ale is what we call cask conditioned and in America is rarer than a Villa fan. The Fullers I had was a nitrogen version and honestly? I should have just had Guinness. Another funny beer story… Budweiser (the official sponsor of Man U) had a special: for a mere $3.25 you could “show your colors” by drinking red Budweiser (Bud regular) for Man U and blue Bud for Chelsea (Bud light.) Are Chelsea fans fatter or something? I pounded down the first beer before the kickoff. What was up with the Star Wars dancers before the match and why do they (Superbowl, Champions League final, etc.) do this? Do the producers of these shows really think we need to see 100 people dressed up like Emperor Palpatine’s personal guard waving flags around golden half footballs? Jesus, these big events pull out the stupidest choreographers and costume designers. The rest of the match was pretty boring stuff. Sure, Ronaldo scored, then Mr. Precious and His Mum equalized, and then Man U decided to play for penalties — YAWN. There was a guy standing next to me in a Chelsea shirt who cheered when Man U scored. Not a polite little clap mind you, but the full blooded roar of a man who just won the lottery. I stared at him for fully two minutes after that. Was he a true Chelsea supporter? Was he wearing the Chelsea kit because he was like an albatross and whoever he supported was destined to lose and he really wanted Man U to win? Was he just a moron? I forgot about that guy and went back to the match. There were a few moments of decent football here and there to offset the queasy feeling I had after having to watch both Ronaldo and Lampard score. Disgusting. I did rather enjoy Paul Scholes getting a broken nose after he tried to decapitate Makalele. I was kind of hoping that the two of them would fight to the death. But no, the only fight on the pitch was when Drogba went completely insane and slapped someone from Man U. That was my first moment of true gut laughter for the day and obviously foreshadowing for the remainder of the match. Oh there is a God. First, I think that if you stop and stare at the keeper in the middle of your run up to take the penalty, you should be given a straight red card. I know, that’s not the rule, but doing that is far more unsporting than lovingly touching your opponent’s face which everyone agrees is a straight red. At the very least the player who stops in the middle of a penalty should have his attempt ruled as a miss. As soon as you stop in the middle of your run up, the ref blows the whistle, it’s ruled a miss, and the next guy step up. Maybe it was the beer, but as I watched Ronaldo take the penalty I thought I saw the hand of God reach down and block the shot. Justice was, clearly, served. Ronaldo was left weeping on the pitch, having reached the finals of the highest stage, the weight of his teammates firmly on his shoulders, and having failed fantastically. It was, so far, the best penalty kicks series I had ever seen. Then, John Terry stepped up to take the winner. He straightened his captains armband. Spit, not once, but twice: big hocking loogies, once left and once right. Placed the ball. 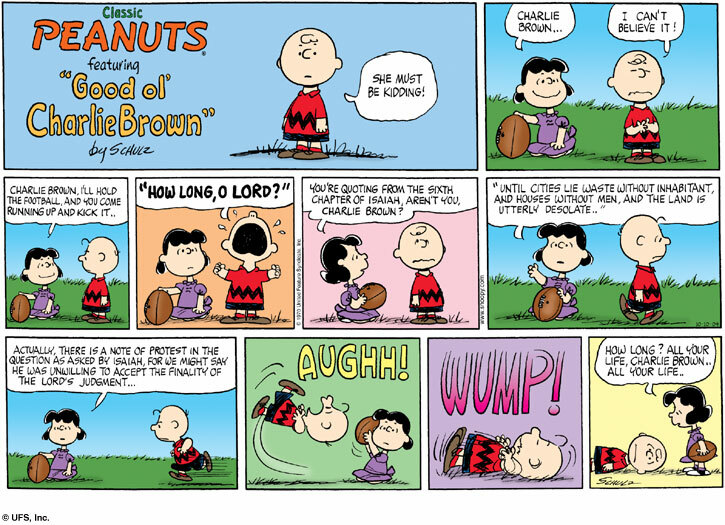 Took three steps back, and then, like Charlie Brown being mocked by God, promptly missed. HOLY CRAP! This is the greatest penalty kicks ever! No matter what happens now, neither team can claim they outright deserved the win. Man U because they were unjustly arrogant and just plain lucky and Chelsea because there on the mountain top they were found lacking: Drogba’s madness and Terry’s slip were all the proof one needs of that. Within minutes Chelsea were already whining about the loss with Lampard saying that the “better” team lost. You do realize, Frank, that narcissism is a mental illness, right? 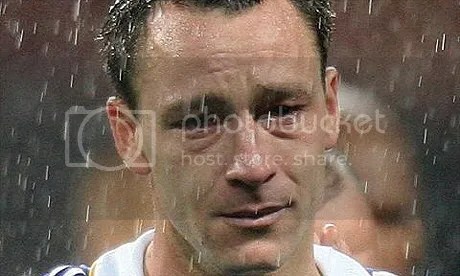 Meanwhile, it’s been revealed that Terry wasn’t in the top 6 to take the penalty. Even given Dogbag’s sending off, that means that someone else backed out at the last minute… Frank Lampard? That’s who I’d put my money on. Meanwhile over at Man U, Ronaldo showed his class and refused to commit to Man U. He could very well take his traveling sideshow of penalty misses and gelled hair to Spain. And that’s it. Man U get £85m in winnings and maybe now they can pay some of the transfer fees that they owe. Meanwhile Chelsea have to see if their owner wants to stay the course having tasted defeat so bitterly. I was talking to my French friend at half time yesterday and he said L’Equipe was reporting that the Nasri deal was a done deal. To which I replied “L’Equipe is one of the least reliable news sources in the world.” Turns out that I was right. The Nasri deal has hit a bit of a snag with the player reportedly holding out for better terms. Until I read it on the dot com, it’s all just a bunch of crap, wrapped in lies and brokered by an agent. Speaking of agents, Milan is after Adebayor and Arsenal are after Robinho. Riiiight… the only thing I know for sure is that Carlos Vela got a work permit and is expected to play first team football next season. And that’s it folks, see you tomorrow.